The National Weather Service says Western Kentucky will remain under a flood watch until 6:00 Tuesday morning. Forecasters say a total of 2 to 4 inches of rainfall is expected at many locations. 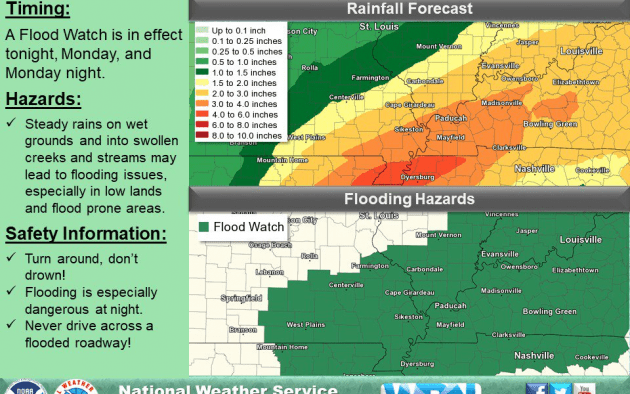 Locally higher amounts are possible, especially over southern portions of southeast Missouri and western Kentucky. This is another round of soaking rainfall, similar to our last bout. With rivers already in flood, and most of our creeks, streams, and tributaries still in recovery from the last rains, the ability of our grounds and water bodies to absorb this next rain system will be challenged. Rainfall runoff is expected to lead to areal flooding issues. River flooding will likely be prolonged, and possibly could worsen with time.